WEST POINT, MS – GelPro’s all-new Multi-Purpose Comfort Mats with Mossy Oak camo patterns are the perfect fit for outdoor enthusiasts. Show your love for the great outdoors with a GelPro mat in front of your kitchen sink or stove, in your hunting lodge, lease, camper, or at your workbench. These mats also make a great addition to your deer blind where you stand or kneel for extended periods of time. Mossy Oak® Designer Comfort Mats deliver a perfect blend of GelPro’s comfort technology and quality at an exceptional value. This energy-return polyurethane foam won’t bottom out or harden over time. Designer Comfort Mats have a 1-year warranty. Prices begin at $49.95 at www.gelpro.com. Mossy Oak® GelPro® Elite Comfort Mats are the most luxurious comfort mats available on the market. Engineered with the most advanced comfort technology available featuring an ultra-plush Dual Comfort Core of patented gel and energy return foam. GelPro Comfort Mats have a 5-year warranty. Prices begin at $124.95 at www.gelpro.com. Mossy Oak camouflage patterns featured on these all-new Comfort Mats are America’s No. 1 Camo Pattern and the official camouflage of the QDMA, Break-Up Country. 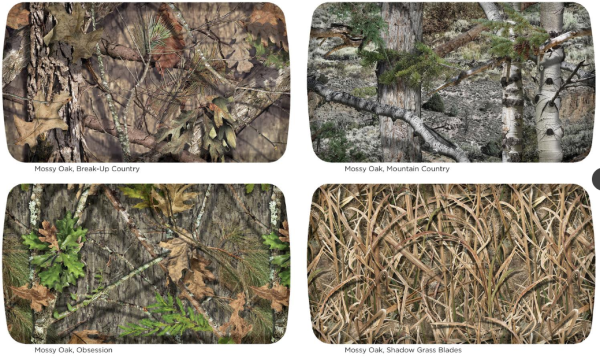 Also included in these product lines are Shadow Grass Blades, the official camouflage of Ducks Unlimited and Obsession, the official camouflage of the National Wild Turkey Fedartion in addition to the inclusion of Mountain Country. “We are proud to partner with Mossy Oak for our camo comfort mat line. We believe GelPro’s innovative comfort technology paired with the world class designs and global recognition of Mossy Oak makes a great team,” said Robb McMahan, CEO of GelPro. To learn more about Mossy Oak, visit https://www.mossyoak.com, or to enjoy free, on-demand outdoor entertainment, visit https://go.mossyoak.com/. GelPro® is an official licensee of Haas Outdoors Inc. Established in 1986, Haas Outdoors Inc. is headquartered in West Point, Miss., and is home of Mossy Oak. For more than 30 years, Mossy Oak has been a leading outdoors lifestyle brand that specializes in developing and marketing modern camouflage designs for hunters and outdoors enthusiasts. The Mossy Oak Brand and patterns can be found on a multitude of products worldwide. Haas Outdoors Inc. is the parent company of Mossy Oak, BioLogic, Capture Productions, MOOSE Media, Nativ Nurseries, Nativ Living, GameKeepers, GameKeepers Kennels and Mossy Oak Properties. Mossy Oak is the official camouflage of the National Wild Turkey Federation, Ducks Unlimited, Quality Deer Management Association, and Mack’s Prairie Wings and the official pattern of the NRA, B.A.S.S., MLF and Cabela’s Collegiate Bass Fishing Series.